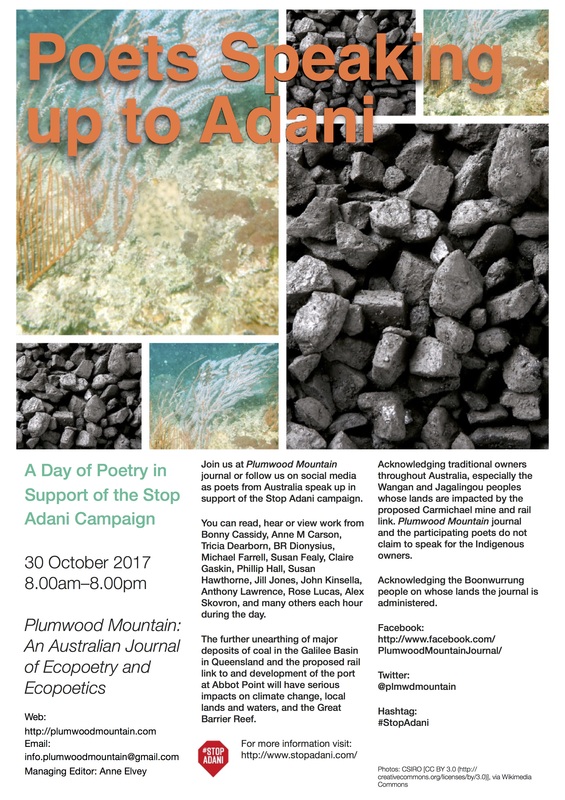 On Monday 30 October 2017, Plumwood Mountain journal will be hosting 12 hours of poets sharing their work as text, audio or video to speak up to Adani. Expect surprises. Not everything will be a direct protest poem. If you are a teacher, you may wish to invite your students to consider the ways the poems speak to the idea of unearthing 2.3 billion tonnes of coal over the next 60 years, the burning of which would add 4.6 billion tonnes of carbon dioxide to the atmosphere (see Stop Adani Fact Sheet). The impact in terms of climate change and export of coal through the Great Barrier Reef World Heritage area, will greatly diminish the reef’s already precarious capacity to survive. Come along and follow the poetry on the Plumwood Mountain website or social media (Facebook and Twitter). You can also participate by taking up a suggested action here or donating here. Consider donating to the Wangan Jangalingou Traditional Owners Aboriginal Corporation to support their fight to defend their lands from Adani. See further the archived front page from the day and the poets and poems featured.